Home eyes health health news red eyes DANGER! IF ONLY ONE EYE IS RED WHEN TAKING A PICTURE, VISIT YOUR DOCTOR IMMEDIATELY! DANGER! IF ONLY ONE EYE IS RED WHEN TAKING A PICTURE, VISIT YOUR DOCTOR IMMEDIATELY! Early stage tumors are almost impossible to detect in the eye, but some people save their children thanks to photographs and unusual glow of eyes on them. If you see your image, or anyone else’s picture, especially children, where to have one eye red from the flash, it can be a sign of retinoblastoma, or a form of cancer of the eye. There is a story about a mother Naomi Whitmore which is due to the photograph she noticed a strange glint in only one eye of her son. Thanks to that photograph her child is still alive. After the first photo and the strange glow, the mother discovered it on several other pictures. What she discovered really surprised and scared her and she decided to seek the help of a doctor and show the photos to patirnts which have worried. After the doctor saw the photos, he immediately noticed something wrong with the boy’s eye. After the testing it was found that Harry’s left eye has five small tumors. Retinoblastoma is a rapidly progressing cancer that develops in the cells of the retina, and the odd glint in the eye of the photos was a reflection of the tumor. This early stage of tumor is almost impossible to detect, and that the mother did not took pictures of boys and responded to doubt today Harry probably would not be alive. Retinoblastoma is a rapidly progressing cancer that develops in the cells of the retina. In developed countries, retinoblastoma has one of the highest rates of the healing of all malignant tumors in children (95-98%), and overall survival of over 90%. Retinoblastoma is a tumor which responds very well to treatment. There are two forms of the disease; genetic which is hereditary and non-genetic or, sporadic form. Approximately 55% of children with retinoblastoma have a non-genetic, sporadic form. If there is no history in the family, illness is marked “sporadic” but this does not exclude that this is not necessarily the non-genetic form. In about two thirds of the cases, only one eye is affected (unilateral retinoblastoma); with the third part, tumors develop in both eyes (two-sided retinoblastoma). The number and size of tumors in each eye may vary. The position, size and quantity of tumors have been studied in selecting treatments. The most common and obvious symptom is the abnormal appearance of the pupil. In a healthy eye, the pupil may appear red when we are photographed when using flash, whereas in the affected eye, the pupil may be white or yellow. The yellowish appearance of the pupil can also be seen in dim artificial light and can resemble a cat’s eye. Other less common symptoms are: deterioration of vision, red and irritated eye, stagnating growth or delayed development. 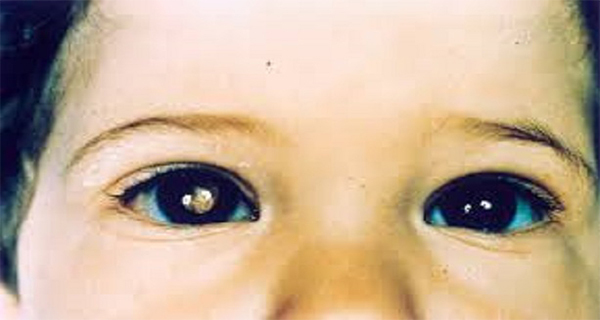 Some children may develop squint, which is often called the “walleye” (looking at the cross) (strabismus). If you notice any of these symptoms, or there is a reason for concern, visit your family doctor or specialist in pediatrics. If the white reflection caught the eye in the photo, the photo can be taken with you to the doctor or specialist in pediatrics. Depending on the position of the tumor, could be visible through the pupil when looking at the ophthalmoscope. A positive diagnosis is usually obtained by examination under anesthesia (EUA). Reflectance of the white of the eye is not always a positive indication of retinoblastoma and can be caused by a poor reflection of light or other conditions such as Coats disease (exudative retinitis).